A year ago a biased article came out in a Los Angeles publication about an aspiring screenwriter and his experience and dealings with Little Studio Films and its partners, Alexandra Yacovlef and Alexia Melocchi. In this article this man, who had a movie idea that he felt Hollywood would respond to, tells a story about his experience with us by making false statements that were never fact checked. A request for a retraction was written to the Editor. I believe it is time you hear straight from the horse’s mouth on the contents of such article as there are always two sides to a story. 1. The writer named in the article, was not truly a screenwriter. He was a man who believed he had a “brilliant idea for a movie” and found us on Facebook using a friend of ours as a referral. He asked if we had professional screenwriters to suggest from our clientele, to help put his”thoughts” into movie screenplay form. We connected him with an ex client of ours and he made an agreement and paid her, directly, the amount quoted in the article. 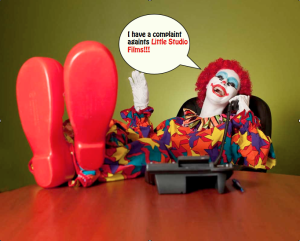 Little Studio Films never received the amount in question. 2. The writer at the time was happy to pay for the services of a professional screenwriter and was thrilled with the work of the screenwriter he had hired and had found through us. 3. After being satisfied with the finished screenplay he asked for a Teaser Trailer and if we would help him present his materials on a consultancy basis at the Cannes Film Festival. Teaser Trailers for screenplay projects are done almost on a regular basis in Hollywood these days. This is because a lot of executives are swamped with email pitches and a visual pitch is always a great medium to tell a story. We outsource our Teaser trailers, even those we make for our completed or in development films, to a wonderful editor who we believe delivers quality results. Editors, like every vendor, require payment for their time and skill set. This Writer never paid for the Teaser in full. 4. The second writer quoted in the article, also an ex client of Little Studio Films and a wonderful author, did not actually say anything negative about our collaboration with him to the journalist covering the story and he let us know of this matter in an email to us. Coincidentally, also he had collaborated with and commissioned for a fee the same writer, whom he had met in a writers’ group in Arizona, to turn his novel into a screenplay. 5. In the article, The journalist stated that Little Studio Films had not produced or released anything since its first movie THE DRONE VIRUS yet we have completed, in a producer or executive producer capacity, a total of three features, two documentaries and two short films. A few have been released for distribution and have been screened at Film Festivals and Markets and others are awaiting release. These are Stealing Roses, Ice Scream, Return To Happiness, Follow Me, Jabal, Soul Journey and Father Mud. 6. Little Studio Films, Alexia Melocchi or Alexandra Yacovlef are not Agents and never claimed to be an Agency as the journalist pointed out Additionally, Managers often produce or consult and there are as well producers working as paid consultants on projects and screenplays. Our long term clients and collaborators have continued to work with us on multiple fronts . We are a mother/daughter team, hard working with big dreams and ideals, and we continue to pursue relentlessly the projects we are developing in house, as well as for the Companies and Talent we consult for and/or represent. We still have the same passion and belief we have had since we started working in Hollywood over two decades ago. We make ourselves available to those who reach out to us with projects to discuss, but I would recommend to all writers, directors, producers, authors out there to hand pick the people and companies they want to work with and do less “email blasting” an activity which may disappoint as it may reach Companies or individuals who may not be a fit for their material, creatively or professionally. My advice for a writer or director or new producer, is that if you feel like you aren’t getting enough forward movement in your career, and you can’t give yourself a list of things to do daily for your career or dream, you probably need a better strategy and structure. IF you push yourself to write, produce, direct, network and make an effort to get to know your future allies, realizing that there are thousands of scripts going around Hollywood on any given year and only a few hundred actually get produced, it is always best to have more ammunition beyond words on paper and try to have professionals with connections and knowledge in your Team. If you have any concerns of how we work feel free to contact us directly. Lastly, If you love good stories with twists and turns, you will be amused to find out that behind this story about Little Studio Films, is an ex client of ours, that same female writer who earned money from both of these other sources mentioned in the article but that’s another blog. Stay Tuned! Dirty Journalism and a Screenwriter’s fixation over Little Studio Films. Theme of this Blog: Robert Altman’s “The Player”.